ZIPPER'S Performance Products has developed its Zip kits as a bolt-on power increase package for Big Twin applications and Sportsters. A wide range of kits are being offered with options on exhausts available, and each kit also including a Zipper's MaxFlow performance air cleaner and a ThunderMax with AutoTune EFI Controller. For Touring models ('09 - '13), the Zip kits exhaust options are complete systems with 2-into-1 headers, 2-into-2 with cross under headers, Rinehart True Duals, replacement mufflers that work with the stock headers or replacement headers to work with the customer's mufflers. All full replacement performance systems Zip kits are fully compatible with the 18mm full rpm-range wide-band sensors that ThunderMax uses. In 2010, H-D changed the size and location of the narrow-band (limited rpm-range) oxygen sensors when they added the catalytic converter to the collector area of the header. ThunderMax can still work with 2010-up headers, but 18mm bungs will need to be added to the factory catalyst-equipped headers. 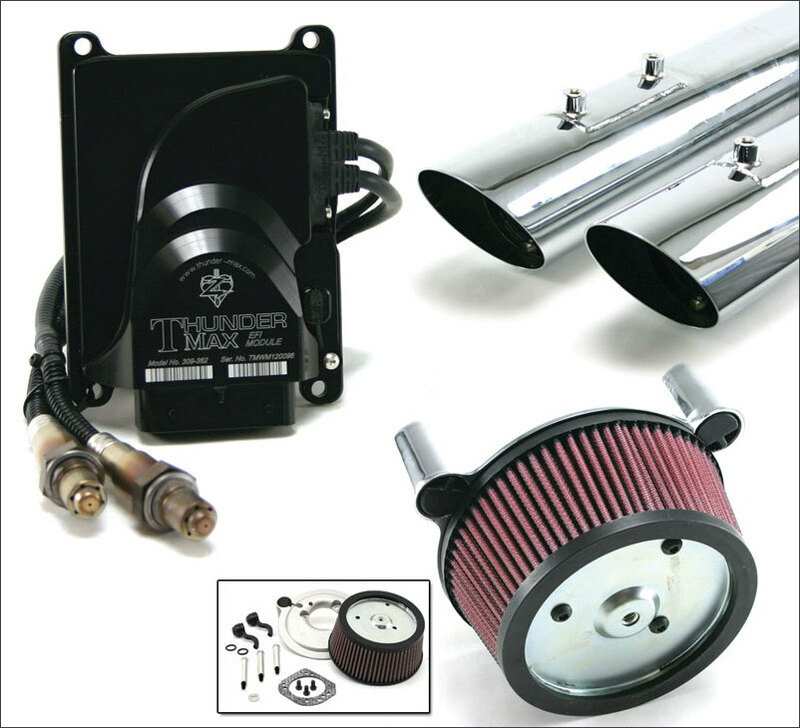 The Factory '09 49-state standard 96ci and 103ci models are equipped with header pipes equipped with 18mm sensor bungs that are fully compatible with ThunderMax. Like the Touring bike kits, the Zip kits for Softail and Dyna models are offered with various exhaust system options, and these include 2-into-1 or 2-into-2 complete replacement exhausts or replacement mufflers only. Once again, all full-replacement performance systems in the Zip kits are fully compatible with the 18mm full rpm-range wide-band sensors that ThunderMax uses. ThunderMax can still work with factory '12 and onward headers, but 18mm bungs will need to be added to the factory headers (weld-in bungs are available separately). For '07 - '11 models using stock header pipes the 18mm sensor bungs fitted as standard are fully compatible with ThunderMax. The Sportster kits are available for '07 - '13 models, and can be purchased with full or partial exhaust systems; 2-into-1 style headers for the complete system or replacement mufflers only.